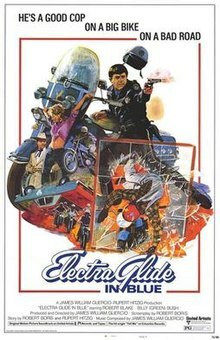 "Electra Glide in Blue" is a 1973 film starring Robert Blake as a motorcycle cop in Arizona and Billy "Green" Bush as his partner. It was produced and directed by James William Guercio. The name stems from the Harley Davidson Electra-Glide motorcycle issued to traffic cops. John Wintergreen is a motorcycle cop who patrols the rural Arizona highways with his partner Zipper. Wintergreen is an experienced patrolman looking to be transferred to the Homicide unit. When he is informed by Crazy Willie of an apparent suicide via shotgun, Wintergreen believes the case is actually a murder as the victim has shot himself in the chest rather than the head, which is more usual. Detective Harve Poole agrees it is a homicide, after a .22 bullet is found amongst the pellets in the man's chest during the autopsy, as well hearing about a possible missing $5,000 ($27,600 today) from the man's home, and arranges for Wintergreen to be transferred to homicide to help with the case. Wintergreen gets his wish, but his joy is short-lived. He begins increasingly to identify with the hippies whom the other officers, including Detective Poole, are endlessly harassing. The final straw comes when Poole discovers that Wintergreen has been sleeping with his girlfriend, Jolene. The hostile workplace politics cause him to be quickly demoted back to traffic enforcement. Despite being demoted, Wintergreen is able to solve the murder. The killer turns out to be Willie, who confesses while Wintergreen goads him into talking about it. Wintergreen surmises Willie did it because he was jealous of the old man he killed, who frequently had young people over to his house to buy drugs. Shortly after, it is discovered that Zipper stole the $5,000, which he used to buy a fully dressed Electra Glide motorcycle. Wintergreen is forced to shoot Zipper after he becomes distressed and belligerent, and shoots at Wintergreen and in the direction of an innocent bystander while brandishing a gun. As the film ends, Wintergreen is alone and back on his old beat, when he runs into a hippie that Zipper was needlessly harassing near the beginning of the film. Wintergreen lets him off with a warning but the hippie forgets his driver's license, and Wintergreen drives up behind his van to return it to him. The hippie's passenger points a shotgun out the back window and shoots Wintergreen, killing him. U.S. United Artists UA LA062-H stereo (1973). Album produced by James William Guercio. The album's original hinged cover is in excellent condition, displaying only minor signs of wear. The album cover has a strong hinge and spine, displaying some minor signs of wear. The album cover has been clipped by H.M. customs and excise, at the upper right corner, (see scan). The original colour, prined inner sleeve is excellently presented. The album's original three large colour posters are perfectly presented.